I’d like to take a moment here to ask a small favor from everyone, if I may: Spread the word about Selkie if you can. I’d love to continue growing the comic’s audience and reaching it out to more like-minded awesome people. So if you know some people who’d like the strip or have been meaning to mention it to someone, please feel encouraged to do so. 😀 Thank you for your help and your continued readership, I greatly appreciate them both. Hmm. Is she fussy enough to insist on fresh, or will canned do? It’s very cute to see the post-nightmare snuggle. You know you’re loved when you can wake someone from a sound sleep and they just offer breakfast. Salmon of course! Thinking celtic myths..Salmon of knowledge and wisdom (for the interpretation of scary dreams maybe?) For myself I prefer raw Tuna to Salmon…no accounting for taste eh? This is what I’ve been looking for out of this comic, Dave. Pure, good-hearted slice-of-life with Selkie and Todd. Not crazy revolutions in her homeland, or cloak-and-dagger type government shenanigans. 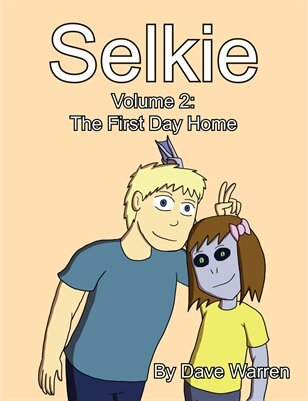 Just a comic about a guy who adopts a daughter and the loving relationship between the two. If you continue along this route, you will have one of the best webcomics to date. It can be both. It is a great comic, and most of us *enjoy* the backstory as it is very much tied to who Selkie is. All of which is quite irrelevant in the grand scheme of things, since it is Dave’s webcomic and you have less than no say in how it goes. Entirely unrelated to the comic, I can strongly recommend Wolf Children. I watched it the other day and it’s a really nice, well written, visually stunning film. I’ve read some of the manga version and liked it, so that’s good to know. Yes, “Wolf Children” is incredible. It seems pretty common. I tend to say funny things but my husband and my sis say weird things. I have successfully tutored people in my sleep, holding complete conversations until the other person asked the one question which I answered in complete nonsense, proving I was asleep. I have no direct recollection of these, but the thanks for the help I provided, I do remember that. Big appetite and Champaign tastes! Awww! Reminds me of my dad who, come Finals week, made sure that kitchen was stocked w/ comfort foods, i.e. chocolate, pop-tarts, caffeine, pizza, whipped cream, Nutella, and potato chips. I have vivid memories of my nightmares as a kid, and climbing into bed with my parents. And noticing how stinky they smelled. One nit: Selkie seeks a hug for comfort, just like a human kid. But this is a characteristic of primates, and Selkie is not a primate, not even a mammal. Not complaining, just noting that Selkie-kind share a lot of characteristics with humans … which makes me doubt they are completely alien. Could they be a Doctor Moreau-style hybrid species? They never smelled bad to me. They smelled like … home. Tell me, m’boy (or m’gel, whichever), have you ever heard of a little somethin’ we like t’call “convergent ee-vo-lution”? Convergent evolution typically only applies to vital features required in order to best adapt to a particular niche… and while they tend to be centered about a particular function, the approach and appearance are completely unrelated. Now, if you’d care to hazard a guess as to how all the various aspects of being humanoid are overwhelmingly advantageous to a point where they would be favoured above all other possible random changes… then I’d like to hear it. Her species is too different to be terrestrial, and yet too similar to be extraterrestrial. Either way, we’ll just have to apply suspension of disbelief. Dave, this is a great strip:) I have been waiting for messy head Todd for a while now:) Thanks! And thanks for showing in the last panel that Todd doesn’t sleep naked. I like what appears to me to be “instinctive male protection reaction”. He’s asleep. His hand is up at his upper chest. She dives in the bed. His hand is at his groin. “I’m being attacked. PROTECT! !” Before the brain realizes WHO is jumping on him, the hand is moving to protect the groin. Very “guy”. I’ve never had kids of my own (so far), but young cats like to jump around, and if you have a dresser next to your bed and they decide that dawn = best time for EVERYONE to wake up, you soon learn to shut them out of your room at night until they grow out of it. A two pound kitten jumping onto your body from a foot or two away is okay. When they get bigger and HEAVIER, and you end up feeling like someone’s punched you in the stomach when they’re just innocently trying to get you out of bed, the behavior needs to change. I ‘liked’ the strip on Facebook. Not that I have more than about 20 people on my friendslist. Never really occurred to me that you actively sought a larger audience, well I have been reading for about 6 months, and I have gotten two friends hooked on it, although neither me nor them have ever taken the time to post. Just figured I would let you know that I’m sure you have a larger audience then you realize just a silent one. Keep up the good work, we appreciate it. Ill try to engage more. and yeah Wolf Children was ADORBS. Am I the only one who’s gonna comment on the smiley tattoos? First, I’d like to state that I like Selkie, and keep coming back for more. However, I didn’t “spread the word” around much, mostly because of the art quality. Now, don’t get me wrong, I do not mean to be offensive, and your art is not bad (I know I wouldn’t do any better, and probably would do much worse), but it’s not *good* either, merely… acceptable, I think, whereas your storytelling skills are really good. The scenario is the strong point of your comic, along with this original setting, the point of view… well, in fact, everything that is written and not drawn, in fact. So, if you’re looking to expand your audience, and maybe even publish your work, might I suggest either working at improving your drawing, or finding an artist who could give your story the art it deserves ? It would help reaching a new audience (many people care about drawings more than they do about the story behind), and it would mean more time to think about the story itself, as tasks would be “shared” (that is, if you associate with someone else). I really hope I haven’t been rude, that my comment will be useful to you, and that you’ll continue to provide us with many Selkie strips. Oh, and I forgot to add in my previous comment: I feel like your art HAS improved. I think I see more shadows, for instance, in the late strips, and the lines are less, err… trembling ? They’re cleaner, better, even if there is still much room for improvement. So, well, what I’m saying is that I think it’s far from hopeless, and you may very well produce very fine art in a near future. So, whatever you choose, I’m confident that Selkie will only get better with time. Selkie has an info page about it on the Ink Outbreak wiki. It’s a skeleton of a thing so far, but here it is. I also strongly recommend a listing on Ink Outbreak proper, and an ad on the banner exchange. Since I’ve been using them, my comic gets more consistent views. The banner exchange is basically for creators to swap free advertising on their sites. Oooh, did not know about that wiki entry. Thanks for the tip-off! I’ll have to look into Ink Outbreak, too. Also, how does the banner exchange work? I have a banner uploaded but if I am reading it right it won’t be shared until I put the exchange link on my own page. Is that all I need to do, copy-paste the exchange code into a widget, or is there another step I’m not seeing? Oooooohhh… thanks for the head’s up on Wolf Children. It says it’s by the same person/people as Summer Wars, and I LOVE that movie. So very, VERY pretty. Dude? if you watch wolf children bring tissues. Great movie… but an absolute tear jerker. I noticed (at Widdershins) that you’re doing a bit of Project Wonderful advertising, Dave. Improbable Island is an independent web browser game that’s advertising here; the developer clearly thinks your readers might like his game. It’s worth a try to see if the converse is true: many of his players might also enjoy Selkie. Full disclosure: I’m a player and a volunteer moderator in the game. I happen to know CavemanJoe is pretty canny about maximizing his PW strategy. He picks his ad locations for maximum effectiveness. He also monitors the results quite closely. If his ads keep on showing up here, that means they’re working.